A selection of activities for every taste! We have compiled an album of activities to present you with an insight into what awaits you recreationally at The Peppertree. This region offers an excellent array of activities – from those associated with our famous wine-growing prowess to the stunning beauty of the Marlborough Sounds. While staying with us, you can enjoy a guided walk or high country horse treks, golf, garden tour, fishing, cruising, helicopter adventure, scenic flights and all manner of vineyard excursion – whether by bicycle, horse-drawn carriage, comfortable car or limousine – privately or in a small group. We are always happy to arrange guided tours with the best local, knowledgeable guides available. Select a tab below for more information on popular options. 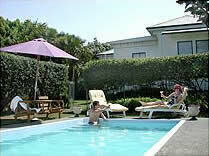 Comfortable deckchairs are in the pool area. Enjoy this popular French game. Or how about lawn croquet? Play a game on the expansive front lawn. Feeling more energetic? Utilize our small gym for your daily workout. Would you like to feed our sheep? They are very friendly and you can even take a photo – all, especially Bobby, are most photogenic. Through the years the Cob Cottage has been used as a farm owner’s cottage, workers’ cottage, shearers’ quarters and was even home to the Riverlands School (1906-1909). The list of its uses even continues further – bookies’ headquarters, stud sheep shelter, Home Guard store and headquarters, storeroom and hay shed. Cob Cottage was fully restored in the early 1960s, the mammoth project involving 5000 hours of mainly voluntary labour. In the last 40 years, general upkeep has been performed and now restoration continues to ensure this part of The Peppertree family remains for future generations to visit. Experience the stunning Marlborough region on a tour with the Marlborough Tour Company. With over 20 years experience, a great team of guides and a large range of vehicles and vessels, we are well placed to look after individuals, couples, small and large groups. From Picton cruise the Queen Charlotte Sound on our Seafood Odyssea daily cruises taking in a visit to Salmon and Oyster farms to learn about seafood farming and taste the freshest seafoods matched to Marlborough’s award winning Sauvignon Blanc. From Havelock marina enjoy the Greenshell Mussel Cruise, a wonderful exploration of the Pelorus and Kenepuru Sounds, two of the Sounds that make up the Marlborough Sounds. Enjoy the quiet peaceful nature of this area, a visit into a mussel farm and the perfect match of fresh steamed mussels with Sauvignon Blanc. 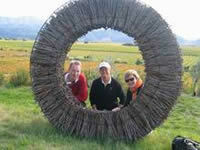 Then based in the famous Marlborough wine region the Taste Marlborough tour, private and luxury wine tours. Enjoy a fantastic behind the scenes wine experience meeting with passionate wine enthusiasts as you tour through a vineyard, through a winery, and through a series of stunning wine tastings. Enjoy fabulous wineries such as Cloudy Bay, Brancott Estate, Auntsfield, Wither Hills and Framingham. Then for those who want everything in one day our Marlborough Icons Tour, the best way to link it all together touring the wine region in the morning and cruising the Marlborough Sounds in the afternoon. Awatere Valley Cultural Experience Tour: Enjoy a relaxing day in the country just 30 minutes south of Blenheim in the stunningly beautiful Awatere Valley. The valley is New Zealand’s third fastest growing wine region; the tour combines local wine tasting with an historical commentary, stunning scenery and the opportunity to meet a local grower on their vineyard. Molesworth High Country Farm Tour: The one day private high country farm tour will let you discover Molesworth Station and the majestic South Island high country scenery with wonderful historical commentary of the early pioneers, and photographic opportunities around every corner. Molesworth Station offers abundant opportunity for visitors to New Zealand to experience natural environments, rural lifestyles and natural history that few people get to experience. Molesworth is located 120km east of Blenheim, the size of Stewart Island at 486,000 acres in size and borders Marlborough, Nelson and the Canterbury high country. Meet the Royal Spoonbill! Get close to the beautiful birds that Will Parsons loves to photograph and hear him share his expert advice on wildlife photography. Driftwood Eco-Tours invites you to a new series of kayak tours. In addition, there are a wealth of walking tracks in the Marlborough area as well as seven golf courses and a driving range within a 20km radius (green’s fees are extremely reasonable in NZ). We have a complete listing of options available during your stay and are more than happy to provide recommendations and/or make arrangements. You can also contact the Marlborough I-Site in Blenheim for further information on the area.